No matter how long you’ve been in a relationship, you don’t really know a person until you’ve travelled with them. A journey together can take you through all ups and downs, thicks and thins, and make the bond last forever because we truly believe that people who trip together, stick together. Maybe exploring new places with your SO is what leads to exploring each other while on a journey, and spending 24/7 with one another in an unknown territory help you find your perfect place. On that not, we recommend The Perfect Us by Durjoy Dutta, a great read you can add to your travel essentials. The narrative is all about Avantika and Deb, who’ve been in a relationship for 10 years and are still in the quest of the their perfect happy place. So we say, take some time out of the regular hustle bustle of your life and check out these destinations that will make you fall in love all over again. Fine literature and drinking, that’s most of everything to this gorg city, rich in heritage for travellers to soak up. If you’re someone who loves to discover new places, people, culture and dive into the history of every place you visit, add Dublin to your dream destinations. Going here with your better half means you’ll end up learning a lot about each other with newest of old experiences. Must visit- Guinness Storehouse, Old Jameson Distillery, Dublin Writer’s Museum, Porterhouse, Kilmainham Gaol, Dublin Castle and Merrion Square. This place will make you feel like a royalty without paying the price for it. This former imperial city still has the remnants of its luxury with maze-like alleys that offer souks of traditional textiles, pottery and jewellery. Not to be missed are the ethereal palaces, gardens and mosques. This is a must visit destination with your partner because chances are that you will manage to get lost at least once in those alleys, tired, hungry, annoyed yet walking next to each other looking for the right path. This place will find you both having a stupid argument and laughing over it later. Must visit - Koutoubia Mosque, Jemaa El Fna Market, Rahba Kedima Spice Market, Majorelle Gardens, Tannery District, Badii Palace, Ensemble Artisanal, Nomad Restaurant, Café Clock, Le Jardin, Comptoir, Les Bains de Marrakech. Don’t get lost in pronouncing the name of this paradise just yet, because this beautiful land is bound to take your breath away. It’s a dreamland for those who love to stay outdoors! If you’re someone who loves to hike, this place offers beauteous views of the Aurora Borealis. So go hiking or take the coastal bike tour, the choice is yours. We would say do it all! Once you’re here, do not (we mean you must not) miss the spectacular view of Northern Lights. It’s an experience that will make your heart melt with the love of your life right next to you. Must visit - Hallgrímskirkja, Golden Circle, The Sun Voyager Sculpture, Tjörnin Lake, Elliðaár River, Landakotskirkja Cathedral, Hike Viðey Island, Reykjadalur Hot Springs, Laugavegur Street, Slipp Bar, 101 Restaurant. While Mykonos and Santorini are trending at par these days, the latter is more suited as a couple destination while the former is more of a party place. The picturesque white hillside villages with crystal blue water makes for a dreamy vacation. We believe that a key part of travelling with your SO is to be able to try new and different things which you usually miss out on in your regular life back home and Santorini is going to give you that much needed escape. While you’re there, try the donkey ride to Fira and head over to Amoudi Bay for cliff jumping taking a happy leap together to the happy future. This one’s for the lovers of nature! It’s one of the most calm and serene places to visit if you’re looking to step away for a while from the rigmarole of a city life and everyday house chores. Spend some peaceful time with your partner here and leave all the arguments at your doorstep. Feel rejuvenated with varieties of temples and forestry. Rich in Buddhist culture, this place is all about spiritual upliftment and will help you understand your soulmate on a deeper level. So if you’ve been sleeping next to each other but haven’t got the time to have a goof long conversation or haven’t been able to take some time out for each other in general, take a break, pick a destination and rekindle your love. Love to read on the go?? 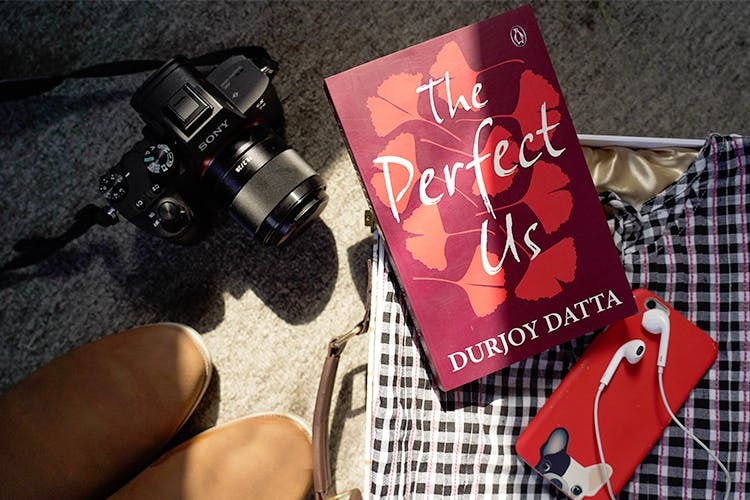 Grab a copy of The Perfect Us by Durjoy Dutta and get to know more about couples trying to look for their happily ever after.